I love Auto Trim Hawaii/Window Tint Hawaii! I’ve used them many times before and the owner Sean is always professional and helpful. What prompted this review is something I wished I had done years ago…tinting my living room windows. The sun hits directly from about 8a.m.-4 p.m. and heats up the whole house. We installed black out drapes to help but then we are forced to keep our drapes closed when we are home. We also wanted to have some privacy so our nearby neighbor can’t see into our home during the day. Solution? 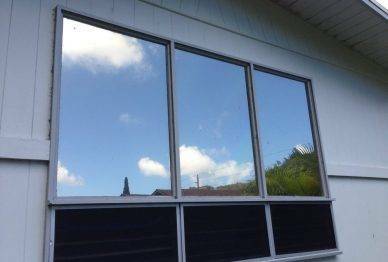 Steve from WTH came and quickly installed this amazing limo-like mirror tint to three windows. Even after the first window was done I could immediately feel the temperature in the room drop considerably. After all three windows were done, the difference was like night and day…or should I say day and night. Steve was very professional and I could tell he knew what he was doing. I would highly recommend them to all my friends. This was easily one of my top 10 best investments and my only regret was that I didn’t have them do it sooner. The owner Sean was super helpful. He was straight and to the point with answering my questions about tinting. His work was professional and the tint job that he did on my Honda Fit looks awesome! I’m definitely coming back again to get my front window tinted. I stopped by Auto Trim Hawaii on the way home after just picking up my new car. Sean was very professional and went over my body molding and tinting options. He ordered the paint and parts and called me to set up an appt when they came in. I dropped off the car and the work was completed in under 3 hrs. The paint match was perfect and the tint was very well done. The Autobahn tint film has a lifetime warranty and even has a one time replacement warranty if you damage the tint yourself. I would highly recommend Sean and his team for their excellent services. While you’re waiting Sugoi’s and Kam Bakery are right around the corner.